Shirley Fietsam started taking lessons in 1975. I watched her grow into a great dancer. 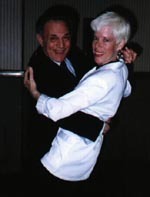 She and Tom Boots won Dance Fever twice. Every Male dancer wants to dance with her. She isn't flashy, but will get to everyone's level, which they love. I've never seen her turn down a dancer. She also won two Hall of Fame medallions. She is the only one who has done so. I was honored to be attached to her for 4 yrs. 1991-1994. We are the best of friends and there isn't anything I wouldn't do for her. You can tell she is a favorite of mine. 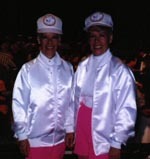 She and her twin sister Sharen have worked the US Open for the past 15 yrs. Sharen is the sweeper and Shirley picks up the tallys from the floor judges. And again they will work the Open next week. 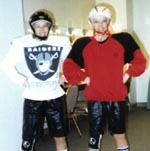 They ALWAYS wear colorful costumes --- and have never repeated themselves! We would certainly leave milk and cookies out for them! This is enough to turn anyone into a currency speculator! 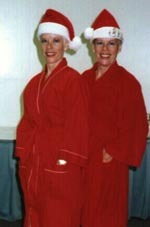 Maxie Says: "Can you imagine after 15 yrs the different costumes the twins changed for each event and never duplicated. That's dedication." 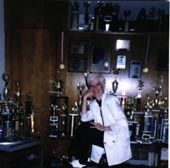 This is Shirley Fietsam in her Trophy Room that contains over 100 awards that she has won.